Lunch break with two school kids in foothills of the Andes in Ecuador. Dr. 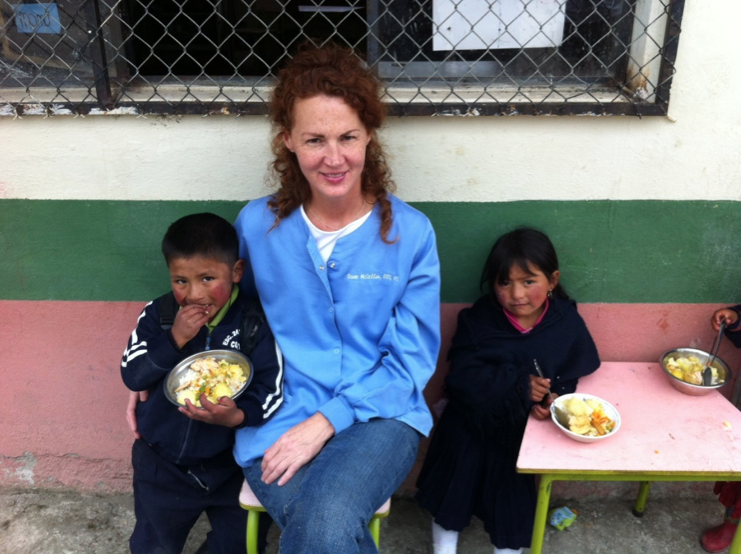 Dawn McClellan has always known that patients with oral health needs exist in all corners of the globe. Long before she graduated from The Ohio State University College of Dentistry, one of her first volunteer experiences abroad was helping patients in a leper colony in Nigeria at the age of nineteen. “As an Ohio teen, I spent 10 weeks in Nigeria, where nothing was how I foolishly expected it to be. That would become a defining moment, one that I have measured every major decision of my life against from that point forward,” shares Dr. McClellan. She began her career with the United States Public Health Service in North Dakota with the Chippewa Indians. That led to volunteering dental care in Kenya for six months, followed by completion of the specialty program in pediatric dentistry at The Ohio State University, before heading to Saudi Arabia to practice there for two years. The international globetrotting doesn’t end there. 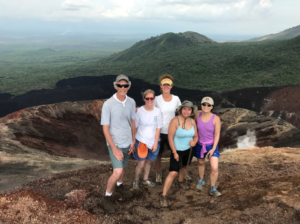 Hiking volcanoes in Nicaragua May 2017 after a dental outreach program. Dr. McClellan’s next international move was back to the United States, out west to Nevada. Her career restarted again in private practice in a suburban setting. As time passed on, the motivation to help children lacking access to oral health care, became a top priority. She decided to take on the challenge of helping kids whose dental care often falls through the cracks. Moving into an at-risk area in Las Vegas, she worked with county commissioners and sought other grants, to target the uninsured and working poor to help them overcome obstacles with obtaining dental care, free of charge. Many practitioners already seek new ways to deliver their services for the betterment of others through unique programs. However, there are often times when existing programs do not meet the oral health needs of patients in their own community. In 2001, Dr. McClellan, as co-founder, formed Dental Care International, a 501 (c) 3 non-profit organization based in Las Vegas to meet those unmet needs of the children in Las Vegas. The organization provides orthodontics and pediatric dental care to 15,000 patients a year in the city. It also offers sliding scale rates for children based on family income and is always willing to work with families’ needs. DCI’s goal is to help children maintain optimal oral health throughout their lifetimes. Las Vegas, one of the intake cities in the country for new refugees first arriving in the U.S., is where they choose to start their efforts. The organization works with non-profits and community partnerships in town to help connect to patients that may not have anyplace else to go. It also serves homeless children’s groups, women and children who have been removed from violent situations, and children whose families can’t afford to take time off or pay for dental care. What country is halfway around the globe from Las Vegas, Nevada, a former war ravaged place, and has no other American groups assisting there? The island nation, Sri Lanka. For decades the South Asian country was mired in a Civil War that prevented many foreign groups from coming to its aid. Not everybody – in 2001, DCI worked during war in mobile clinics in refugee camps, children’s homes, schools and tea plantations. In 2009, a formal cease fire then enabled Dr. McClellan‘s next mission/challenge. In 2012, DCI created a dental assistant training program, a program for a field not well-known yet in Sri Lanka. For one year, the girls work in classes of 10-15 and receive comprehensive training on dental assisting. They work with local Sri Lankan dentists and staff who teach using U.S. training modules that the team has created. 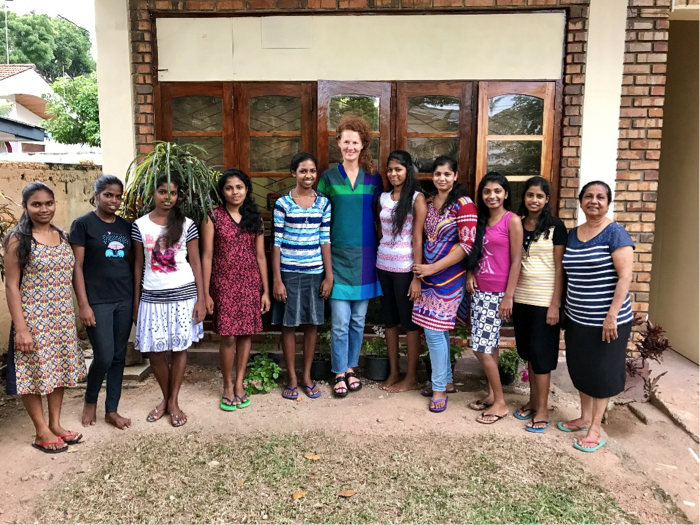 In addition to learning about dentistry, the girls also receive lessons in English, math and many other subjects that have been neglected in their lifetime because of the lack of options in the war torn country. The program is valued at $2,400 annually per student, which covers the room, board and education. The costs are completely covered by sponsors. Indeed, many of the girls go on to become the only person in their extended families to earn money and have a career for themselves. The program’s current coordinator is also one of its success stories. Five years ago, Darshani Sadalanka was a student herself. Now, she helps other orphans who share similar experiences, as an instructor with the program. “Lots of young girls like me did not have a chance for education because of poverty or tragedy that caused us to be taken to a children’s home. I’m lucky because I got the opportunity to participate in this program and it’s given me a reason and a purpose, a future that I would not have had,” Ms. Sadalanka shares. “Before, I didn’t have any choices, I just did what I was told. Now, I have choices and can make decisions in my life,” Ms. Sadalanka tells of the transformation the program has had on her life. DCI has also led the charge for continuing education courses in Colombo, Sri Lanka’s capital, for free one-day courses. Now in its third year, it helps establish the profession of dental assistants, in a country where they previously did not exist. DCI has also been working in Cuenca, Ecuador since 2009. A team of volunteer dental professionals and non-dental professionals provides dental services to rural school children in the Andes. DCI collaborates with the local Ecuadorian dental schools in running this community outreach program. Dentists, hygienists, dental assistants, and non-dental professionals make up the group of volunteers from the United States travel twice a year, to the foothills of the Andes Mountains in Ecuador. The 10 day trip incorporates both teaching time to the local students, plus the delivery of care to school age children, in collaboration with local dentists in that area. DCI has treated more than 2700 children in Ecuador and have provided over $850,000 in charitable contributions. The next trip to Ecuador is October 2018 and is already a fully booked trip with dental professionals eager to provide care in an area that has limited basic oral health services. The 2019 calendar of opportunities is available for additional volunteers. To learn more about international volunteer programs, visit the ADA Foundation’s International Programs website to find a program that fits your needs, or visit the trip calendar to view volunteer opportunities by month. Dr. Dawn McClellan is a Diplomate of the American Board of Pediatric Dentistry. She is a member of the American Dental Association, the American Academy of Pediatric Dentistry, and the Nevada Academy of Pediatric Dentistry. Dr. McClellan has traveled to all 7 continents and 75 countries. Dentistry has taken her from an AIDS orphanage in the Bahamas, to young soldiers caught in a civil war in Somalia, from children of refugee camps in Sri Lanka, to forgotten urban poor in the ghettos of India, and from isolated tribes in rural western Kenya to the deserts of Saudi Arabia. She is a practicing dentist in Las Vegas, Nevada. I had the pleasure of meeting Dr. McClellan recently. Her work on behalf of the underserved in the states and abroad is an inspiration to me. She is changing lives for the better around the globe. Dawn, and people like her ought to be the people featured on television and social media as they are truly inspirational and excellent role models for the next generation. We are SO proud of our niece! Thank you! She has done so much for so many! I have just read about the heart of this noble dentist. It is my prayer and hope for your continued success and support. Even though I am not able to assist at this time, be assured that my prayers are to become able to assist you in the very near future. I trust God to make this happen. You will be hearing from me soon.